Wow! 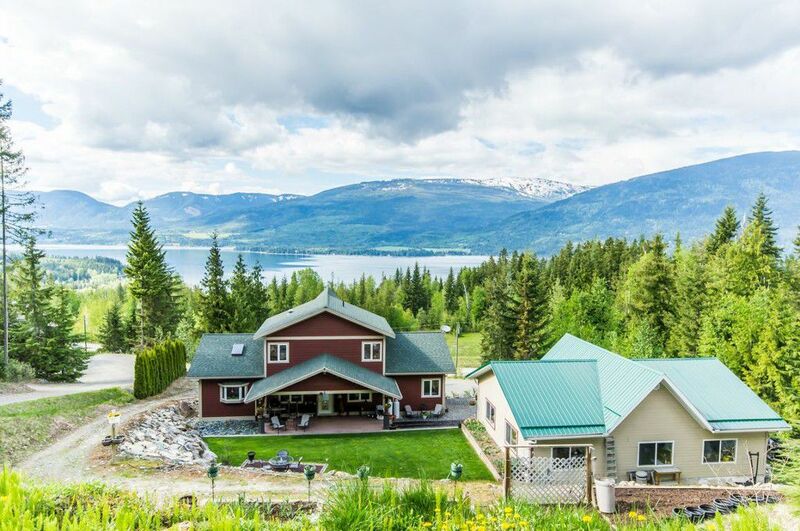 This stunning lakeview home is perched above Shuswap Lake in Eagle Bay & offers 5 Bedrms & 4 Bathrms with over 3700SqFt! Includes a fully self contained bsmt suite area (no cabinets or flooring) too. The level entry main floor has all you need with 20Ft high vaulted wood ceilings & wall to wall, floor to ceiling windows to bask in the lakeviews! Corner gas fireplace, hardwood floors, sound system & high-end fixtures. The oversized kitchen has endless counters & tons of cabinetry with a herb garden bay window & skylight and more vaulted ceilings that span over the dining area that suits a large table, offers double glass french doors onto the lakeview wrap around deck. Both Kitchen & dining rooms are tiled throughout. The main floor master is over sized with vaulted ceilings, glass french doors onto the lakeview deck & a spa-like 5 pce ensuite including double sinks & corner soaker tub fit for two as well as a large walk-in shower! The main floor also has a bedroom/den, full bathrm & laundry. The open concept stairs lead to 2 upper bedrms, full bathrm & loft. The walk-out lower level offers a full media room, craft/shop room with pellet stove, a guest foyer & the full 1 bedrm suite area. Security alarm system. Detached oversized 30'x40' garage also has 3rd bay heated workshop, RV parking, garden, covered patio, firepit. Easy access to Shuswap Lake & Gov't boat launch. "S" shaped driveway offers vehicle access to all levels including garden area. Great recreational area with tons of trails to explore! Garage with Shop: 30 Ft x 40 Ft detached garage with heated shop area!